September 28th is the Date of Birth of Shirdi Sai Baba. On this auspicious day, we shall read some of the messages from Bhagavan about this previous Avatar in His own words. Here are some extracts from "SAI VAANI". In the former Nizam’s dominion, in Aurangabad district, there was a remote village called Pathri. In that village, there lived a couple by name Gangabhavadya and Devagiriamma. They were aggrieved because they did not have any children. In answer to their prayers, a son was born to Devagiriamma, on September 28th, 1835. That child was Sai Baba. On account of passage of time and circumstances, no one knew the exact dates of Baba’s birth and passing. In this context, the mystery relating to Baba’s birth should be noted. Gangabhavadya and Devagiriamma hailed from Pathri village, and they were ardent worshippers of Eshwara and Parvathi. They had no offspring for a long time. They intensified their prayers. Gangabhavadya used to ply a boat near the village for living. One night, when it was raining heavily, Gangabhavadya left his house to take care of the boat, informing his wife that he would not return that night. After her husband had left, Devagiriamma had her food and went to bed early. At 9 p.m., there was a knock at the door. Devagiriamma opened the door expecting the likely return of her husband. Instead, a very elderly man entered the house. He pleaded, "It is very cold outside. Please permit me, mother, to stay inside." Being a pious woman, Devagiriamma allowed him to stay in the verandah and went inside the house after bolting the inner door. A little while later, there was a knock on the inner door. She opened the door. The old man said, "I am feeling hungry, give me some food." Finding that there was no food, the woman mixed some flour with curds and gave it to him. There was again another knock after some time. When she opened the door, the old man said, "My legs are aching. Mother, will you massage them?" Devagiriamma went inside, sat in prayer room and prayed: "Oh Mother! Why are you testing me like this? What should I do? Should I serve him or refuse?" Going out of the house by the back door, she went in search of someone who could be engaged to render this service. No one was available. As she returned there was another knock from the old man. At the same time, a woman knocked at the back door. The woman said, "It appears you came to my house and sought some feminine help. I was away at that time. Please let me know what service I should render." Feeling happy that Goddess Parvathi herself had sent the woman in response to here prayers, Devagiriamma sent the newcomer to the verandah for serving the old man and closed the door. "I am immensely pleased with your devotion. I shall take birth as your third child." When Devagiriama got up, the Divine couple was not there. Feeling ecstatic over the experience, Devagiriamma eagerly awaited the return of her husband in the morning to relate to him the whole experience. The husband returned in the morning. She related to him all that happened the previous night. The husband said, "Devagiri, what is this entirely fanciful tale! It is all a dream. Parvathi and Parameshwara appearing before you and giving Darshan! It is pure fantasy!" Gangabhavadya dismissed the whole episode as incredible and fanciful. But, as time passed, Devagiriamma became enceinte and a son was born. A year later a daughter was born. Gangabhavadya was convinced that the birth of the two children was the result of the blessings conferred by Parvathi and Parameshwara. He told his wife, "You had the good fortune of having Darshan of Parvathi and Parameshwara. I did not have that luck." When Devagiriamma conceived again, Gangabhavadya began to feel an urge to give up hearth and home and go in search of Divine couple. He told his wife that he was leaving for the forest to do penance. Devoted wife that she was, Devagiriamma decided to follow him though she was in the ninth month of her pregnancy. After following her husband for some distance, she developed labor pains. She delivered a boy. Wrapping the babe in a piece of cloth, she left the child by the roadside and followed her husband. In the same village, there lived a Sufi Fakir. He too was childless. He took charge of this child and brought him up in his home. The boy stayed in the fakir’s home for four years (1835 to 1839) The fakir passed away in the tide of time. The fakir’s wife, wh9o had lavished great affection on the child, was grief-stricken. To add to her worries, the boy was behaving in a troublesome manner. In those days, Hindu-Muslim differences in that area, were growing. At an alarming rate. The boy used to visit Hindu temples and sing some songs in praise of Allah. "Mein Allah hoon" (I am God). "Allah Malik Hai" (Allah is supreme Lord.) He used to declare in this manner in the temple. The Hindus used to chastise the boy in various ways for his misbehavior. He would enter a mosque and declare, "Rama is God", "Siva is Allah". His behavior of singing about Rama and Siva in a mosque and about Allah in the Hindu temple was a puzzle to the public. Members belonging to both the communities went to the fakir’s wife and complained about the boy’s behavior. Unable to deal with the situation, the fakir’s wife handed over the boy to a pious scholar, Gopal Rao Deshmukh, who was called Venkusa by the people on account of his scholarship and wisdom. The boy stayed in Venkusa’s ashram for 12 years from 1839 to 1851. Venkusa was extremely fond of the boy. In every matter, he used to give priority to this boy’s views. Seeing this, in the course of time, members of the ashram developed envy towards the boy. Observing this, one night (1851) the boy left the ashram. He reached Shirdi – a very small village at that time. At Shirdi, Mahalsapathi a priest in a local temple saw him entering the local temple. Looking at his appearance as a Muslim, Mahalsapathi turned him out of the temple. The boy went back and sat under a neem tree. He was only 16 years old at that time. No one knew then what his name was. If anyone asked his name, he would give no answer. He would sometimes retort saying, "Why do you want to know My name?" Because of this, nobody could find out His name. Some villagers from nearby places used to visit Him under the tree and get relief from their ailments. He would take out some leaves, crush them and give them to the ailing persons as a medicine. In this manner, He cured many a person of their illness. News of His healing powers spread all over the surrounding villages. As a result, a large number of people used to come to Him, receive the crushed leaves from Him and get cured of their ailments. Suddenly one morning He disappeared. A futile search was made in the nearby areas to trace Him. He had stayed in Shirdi for barely two months before setting about to wander from place to place. Later in 1858, He returned to Shirdi. There was a village called Dhoop in Aurangabad. A person by name Chandubhai Patel, belonging to a middle class family, lived in Dhoop. As no other form of transport was available in those days, people used to go only on horseback. Chandubhai went on his horse to Aurangabad on some urgent business. When he had finished his business, there at the end of three days, he found that the horse was missing. Disappointed over the missing horse, Chandubhai was returning to Dhoop through dense forests on the way. On his way, he saw a fakir sitting under a tree. The fakir appeared to be lost in his own thoughts. Suddenly the fakir hailed Chandubhai with the words, "Hey Patel! Come here." The fakir liked to smoke chilim (Hookah). As there was no water nearby, the fakir hit the ground with a stick and water gushed forth from the place. He hit again another place with a stick and there was fire. Using the water and the fire, He started smoking his hookah and offered it to Chandubhai also. Chandubhai declined the offer. The fakir asked Chandubhai, "What is worrying you Patel?". Patel asked, "How did you know I am Patel?". "I know everything" replied the Fakir. "You are worried about your horse. You are keeping you eyes on the top of your head! You must lower them to trace your horse. Your horse is grazing under the tree there." Chandubhai saw his horse there. He had a search conducted for the horse in the same place with the help of some workers, but could not find it. But, now he saw it under a tree close to him. Chandubhai was astonished that the fakir had produced water and fire out of earth and had located his missing horse. He appealed to the fakir, "Swami! You have rendered great help to me. Please come with me and share my hospitality." "All right, let us go," the fakir replied. About this time, the marriage of Chandubhai’s niece, who was residing in Shirdi, was settled. Chandubhai had to go to Shirdi for the wedding. He requested the fakir to come along with them. They went in carts to Sshirdi. Mahalsapathi saw the fakir getting down from a cart, and went to Him, and said, "Aayiye! Baba, Aayiye Sai!". 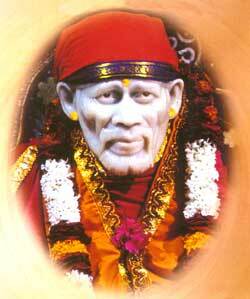 The name "SAI" was given by Mahalsapathi. Till then no one had conferred a name on Him. Sometime later, Baba was accused in a criminal case. He had to give evidence in a case that related to the theft of some valuables from a rich man’s house by a gang of thieves. The police caught the thieves and questioned them about the stolen articles. The thieves said that the valuables had been given to them by a fakir. Searching for the fakir, they came to Baba. They asked Him, "Fakir, did you give these articles to them?" "Yes" He said. "Where did you get them from?" was the next question. Baba replied, "They have come from the same place from which all things come." Finally they asked, "Who gave them to you?" "I gave them myself", was His reply. Question: "What is your religion?" Answer: "The Religion of God"
Q:: "Where do you come from?" Ans: "I have come from Atma"
Q: "What is your caste?" Ans: The case of the Divine". Baba answered all the questions in this manner. Earlier He had been hailed as "SAI". In this examination, He had given his father’s name as Baba. By the combination of these two names, He was therefore called "SAI BABA" No one knew when and where Sai Baba was born and who gave Him that name. Baba came to Shirdi for the second time in 1858. He did not move out of Shirdi from that time. He remained there for sixty years, till 1918. Baba lived for eighty-three years.